New South Wales: 1850 3d green, unused. 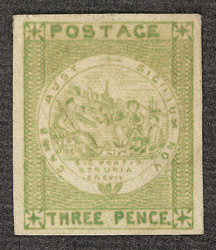 bl.uk > Online Gallery Home	> Online exhibitions	> Philatelic rarities	> New South Wales: 1850 3d green, unused. The first stamps of New South Wales, being 1d, 2d and 3d values, were issued in 1850. The design is a view of Sydney with a seated figure of Industry releasing convicts from their fetters, and pointing to an oxen plouging in the background. The motto Sic fortis Etruria crevit (Thus mighty Eturia grew) is a quotation from Virgil. They are known to collectors as “Sydney Views”.